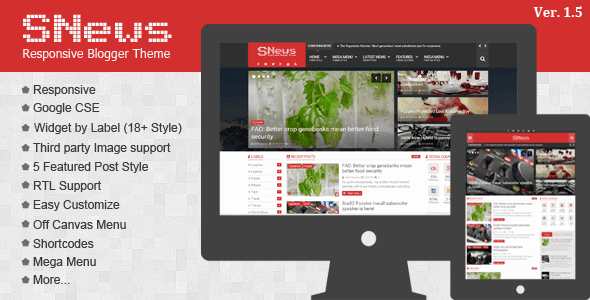 SNews V1.5 - News/Magazine Responsive Blogger Theme Download | BloggersStand ';-1!=b.indexOf("img.youtube.com")&&(a=' ');d=a+''+p+''+titlex+"
Free Download Snews V1.5 News/Magazine Blogspot Template, To Download Snews V1.5 Just Drop Your Email Id Below In Comment Box We Will Send You Directly In Your Email Box,Or You Can Also Ask Us Through Our Contact Us Page.Due To Security Reasons We Are Sending Directly Into Inbox, There Will Be Some Delay In Sending Emails To Our Precious Visitors.Kindly Share Our Website With Your Friends And Do Also Join Us on Social MediaFacebook,Twitter,Google Plus. "We Promise To Deliver Snews V1.5 Template In 5 Hours"
So Far 5 Comments on "SNews V1.5 - News/Magazine Responsive Blogger Theme Download" - Post Yours! Hello Anonymous we have shared Snews V1.5 Blogger Template with you,kindly check your email.Stay tuned for more premium blogger templates and tricks.